Yes we were already onside with this. I'll leave it up to the experts to decide: but I personally can't see any reason why any reputable physical medium would object to thermal imaging being used at his or her séances. Generating of light -- whether dim or bright, red or white -- is one thing, and I can't say "it won't interfere, it won't be dangerous" : I leave that up to the medium and the spirit team to decide. Bur my understanding of thermal imaging (and I'm not claiming to be an engineer) is that it generates no light energy, but merely picks up on the energy-generator that's already there. You will already find this has been gone into in great detail on this forum. Thermography emits no energy just receives heat signals. Its used in food processing and numerous applications where a harmless method is needed. A long time ago David Thompson and his team tried to claim scientific support for the truly appalling residual light film they shot (which looked more like David standing up pretending to be William his guide), using a scientist called Ron Pearson. Ron actually rejected this film as useless but when asked on my behalf about Thermography indicated it would be perfectly safe. Now leave it to the Spirit Team is just allowing fraud to continue! Its what all physical mediums of the modern era say as a reason for refusal (including the well liked Stewart Alexander who, after his Spirit team agreed that Simon Forsyth could film Stewart personally rejected it) . Fine stay in private circles and do not try to darken public seances if you do not accept either thermography or dim red light. Time to make a stand, recently David Thompson has been challenged again, I hear that there was an incident with Scott Milligan that its hard to find much about. This means that all existing purported Physical mediums have major issues. No we cannot leave it to a Spirit Team; for a start I wonder if the frauds really have one or is it, at best, delusional. If a Spirit Team want to work and be genuine they go back into the light. Wait until Lis gets her book on the foundations of Materialisation out it will shock many. Indeed, just as a comment, it is almost impossible to justify any medium of the past who worked in dark seances despite the apparent success. Hmm the nearest we get are those who allowed infra red and the old magnesium flash or how about the daylight events. Not the dark guys but the few who pushed the envelope. Well, I'd be in favor of giving them their choice. White light, or dim red light, or thermography: but they should be willing to work with one of them. Left Behind wrote: Well, I'd be in favor of giving them their choice. White light, or dim red light, or thermography: but they should be willing to work with one of them. Agreed Jim, when we had the tables flying it was in fluorescent light. In my group when they go its in dim white halogen. The limited transfiguration has been in reasonably bright red light. Interesting to reflect on how even Stewart Alexander refused to take part although his spirit-side team had agreed it was OK to go ahead. That's a good few years back now and things haven't changed it seems. What has been the reaction to the AFC's recent introduction of the protocol of recording physical mediumship ie no more in-the-dark demonstrations? Has any physical medium demonstrated there since? Where did this come from? 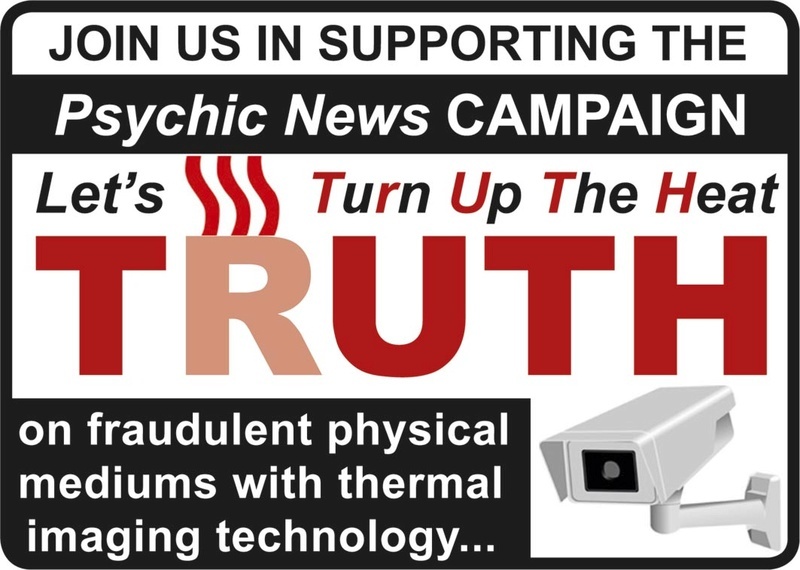 What is the Psychic News Truth campaign? When you say "flying" do you mean levitated - if so, how high and all legs off the ground, or do you sliding around? I found my own answer to the question I asked after a member on another website posted the whole piece. I hadn't looked at the latest PN but now I have. Good piece about Paul Gaunt there. Hi Obi, Jumping off the ground and moving by lifting itself side to side at a speed which had people diving out of the way. It would also go right or left, forward or back, the leg was broken when it landed awkwardly after a jump. We had a skeptical scientist on the table who wrote up a report. mac wrote: I found my own answer to the question I asked after a member on another website posted the whole piece. I hadn't looked at the latest PN but now I have. Good piece about Paul Gaunt there. I thought about posting the whole piece but did not want to push copyright Mac. Its probably worth taking the whole thing for non subscribers. Its a U turn from where Sue Farrow was going with her editorial attacking the AFC protocols because she had become a supporter of Scott ( and more surprisingly, it may appear of David). I understand the copyright aspect, Jim, but my guess would be that Roy Stemman wouldn't object to this particular piece being made available through websites such as your own, especially given the support it has received from the AFC, Banyan and the AAS and the desires of the members of those bodies to distance physical mediumship from the shenanigans surrounding Mannion recently. Perhaps it needed just such a performance to pull focus on those who purport to be physical mediums? The means are available to record what happens without risk of physically harming a medium. Time to draw a line under claimed physical mediumship held publicly but in the dark - all of it. Hi Slatewriter, the most important one is that the materialised Spirit trod on many feet in a seance just as in the one Roy Stemman experienced. I believe none of the members, some very experienced mediums who have sat with different mediums for phenomena, were impressed or really believed in what went on. There may be more to the story, certainly since I have heard more, about other things elesewhere, which cannot be shared through lack current verification. These issues added the icing to the recent Mannion and Muegge issues (I could add so many more to the last two names). Lis will soon be publishing a Two Worlds piece on this issue. Tony Orten has kindly offered us the opportunity to publish this, from the September magazine, on our forum. It is an excellent piece. Just as Light and the Psychological Society called it back in 1882 ( https://www.spiritualismlink.com/t2043-light-and-psychological-review-lead-ban-on-dark-seances ) time for no more Dark Seances, or none without imaging. Remember the list of leading figures and mediums who supported it then (E.g Eglinton, Home, Hardinge Britten, Stainton Moses a long and very impressive list). I believe Scott Milligan is working to try and become able to work, a video is given on his time line ( https://www.facebook.com/scott.milligan.90?hc_ref=PAGES_TIMELINE ). I note only one problem, in commenting about the problems, not only does he just roll out the same tired, historically inaccurate arguments, one may say he gives Mannion wriggle room about how the Spirit world may find it hard to work with Thermography and he is still working with his guides to achieve this (with Banyans help to continue without recording until it is possible) whereas Thermography was just used, unknown, on Mannion. Just do it Scott, Thermography does not emit rays, the old mediums produced phenomena in daylight, magnesium flash and infra red. If anyone was hurt it was when an event was sudden and unexpected not planned. "OH dear. Not surprisingly, the internet was awash with comments and accusations after medium Gary Mannion was filmed cheating at a recent so-called physical séance. He did not know it was being filmed. 'My view is very simple. Years ago, when I was editor of ‘Psychic News’ for the first time around, I wrote and ran an article on the front page which read ‘Let there be light in séance room dark.’ The result? I was roundly attacked in some quarters. 'For years, if someone’s phoned asking if I could recommend a physical medium to sit with, I have always replied that I cannot suggest anyone and they should exercise extreme caution if attending a so-called physical séance, especially if a fat fee to attend is involved. 'I am not in the least surprised by current events, but only greatly saddened that some Spiritualists are so desperate to believe in survival that they accept any allegedly physical phenomena, no matter how banal or easily faked. 'Fortunately, I believe that the majority of Spiritualists assess the evidence sensibly. 'Those who do not and rush into print with fanciful tales of wonderful so-called physical mediumship do not promote our noble cause and ultimately harm it enormously. '‘Two Worlds’ never features contemporary physical mediums, but we do sometimes highlight physical mediums of the past. 'It is up to readers to assess whether necessary precautions were taken and if proper evidence resulted e.g. the medium speaking fluently in foreign languages of which he or she had no normal knowledge, etc. The acid test of all mediumship is this – does it give credible, meaningful evidence of intelligent survival after death? Unless a medium agrees to infra-red cameras and thermal imaging devices recording events, don’t waste your time, money or intelligence going to see direct voice trumpets zooming around or supposed materialisations appearing. Never mind about a so-called medium being secured with cable ties, as it’s relatively easy to slip out of them. Supposed spirit lights can also be faked, as can most of the other totally meaningless phenomena. These wicked and cruel deceptions should be stamped out ASAP and the cash-grabbing culprits named and shamed." Tony Ortzen suggests, quite rightly I believe, that the acid test of all mediumship is whether it gives credible, meaningful evidence of intelligent survival after death. Can the activities taking place in the dark séances of those who currently offer their services as physical mediums to the paying public be seen as meeting that acid test? I think not. Lights, claimed to be 'spirit lights' can all to easily be faked. See the evidence relating to Kai Muegge published by Stephen Braude and Michael Nahm. Ditto regarding false ectoplasm. So called 'materialisations' taking place in complete darkness - a contradiction in terms - I don't believe it is materialisation if the supposed materialisation cannot be seen - again, apparently phenomena that can all too easily be faked, as we have seen in the video of Gary Mannion. Treading on the feet of sitters excused as "spirit demonstrating their presence" - as against the more obvious probability of the so-called medium being out of their restraints and walking around the darkened room - provides little if any evidence credible or meaningful. Ackerson, was caught in fraud. Caylor was, Mannion was. Questions have been raised about the men from Mont Cabriole, David Thompson and Scott Milligan. Despite this, all apparently will continue to sell their dark séances to those who are willing to pay, unless we all stand up and say emphatically and without reservations - NO to Dark Séances. NO to physical séances of any kind unless there is thermal imaging equipment recording what is going on. Fraud can easily be perpetuated in the dark séance room. Trickery can also be achieved in dim light, but it cannot be got away with if thermal imaging equipment is in place. So let us not hesitate. Take a stand and ban all dark séances and all physical mediums who refuse to be tested under stringent conditions that includes the use of thermal imaging equipment. Let us not let these so-called physical mediums use their oft repeated excuses - the spirit team won't allow it - it would be dangerous to the medium's health - the vibrations of the circle would be adversely affected, etc., etc. Nor let them or any of their supporters try to dismiss our concerns using the argument that it is 'Spirit' that is and must be in control of what happens in the séance room, and we cannot 'dictate' what controls should be put in place. The adage "Test the Spirits" should never be forgotten. There's been so much written recently about 'spirit teams' etc. that I almost questioned whether I really understand what I learned all those years ago. But then you guys make me realise the stuff put about by these new-age phenomenalists is just so much garbage - putting it very politely! A good way to look at it all might be this way: as suggested in the first Posts in this Thread, any alleged physical medium who wants to be regarded as credible MUST be willing to allow light OR thermal imagining at his or her séances. If they won't allow it: then we can't say for sure that you're a fraud, but we can say that we're unable to regard you as being credible. I might take it one step further LB and say while a refusal to sit under test conditions that include light or thermal imaging equipment does not of itself say that the medium is a fraud, until they are willing to sit under such conditions they should not be engaged to hold public séances for which they are paid. It will only be when all who have an interest in physical phenomena mediumship are willing to take such a stand that we will begin to stamp out fraud in physical mediumship. This important topic has been reinstated separating the other discussion that took place to its own thread. The TRUTH Campaign (Let's TuRn Up The Heat) on fraudulent physical mediums with thermal imaging technology, is clearly aimed at using a methodology that would remove from our midst anyone claiming to be a physical medium who, in fact, was producing apparent physical phenomena fraudulently. The Campaign is not intrinsically against physical mediumship. It is not biased against physical mediums, nor does it assume that all physical mediums are fraudulent. Quite the contrary, it assumes there are genuine physical mediums and it effectively wants by weeding out the fraudulent mediums to protect the reputation and integrity of those who are genuine. Indeed, to effectively endorse and validate those genuine physical mediums who, by holding séances under controlled test conditions where thermal imaging technology is used, show that no fraud has taken place. The Campaign wants also to protect the integrity and reputation of the Spiritualist movement, and to protect the paying public from being deceived. Such a Campaign is admirable and should be supported. We know there have been many fraudulent physical mediums in the past. Even a cursory examination of the history of physical mediumship confirms this. We know that a number of the current physical mediums have been caught in fraud, and there are others for whom, rightly or wrongly, a cloud of suspicion hangs over them. There are things that have occurred in the séance room of many physical mediums that have given rise to suspicion, but not to hard evidence that fraud is taking place. We should be wary of assuming or claiming that someone is a fraud unless and until there is hard evidence. The use of thermal imaging technology in séances can only help to allay uncertainties and suspicions. Such technology cannot harm the medium or the sitters. Therefore physical mediums who currently offer public séances for fees, or those who aspire to do so, should enthusiastically endorse the Campaign, and willingly offer to sit under such test conditions, knowing as genuine physical mediums they have nothing to fear and everything to gain. I agree with Lis that this is the main issue to hand, not what is, or is not, occurring currently. The proposal to use thermography is a very important step to Truth. However, we are entering a totally new dimension. We do not know how thermography will actually record phenomena. Additionally not all Thermographic cameras are created equal, to get the best possible results the price rises significantly. The company I consulted too used fixed cameras and mobile cameras which were at the top end. The best have a residual light capacity as well, so, for example, were we to record a transfiguration demonstration in red light we would have 3 images, a thermographic heat image, a residual light physical image and through technology a blended image. This would be the same in a table tipping seance which is also at its best in red light (although our table moves in dim halogen lights). This is an ideal place to test the technology and establish some realistic expectation about outcomes. I am aware that there are a number of mediums who can produce transfiguration and achieve table tipping. For transfiguration it would also be a good test of the impact of reality versus the participants visual experiences. It may not even need a medium who is doing this publically, just one willing to help set the right parameters. At the same time we can consider how and why the cameras may be tricked. It is important that, when we use this technology, we understand the limitations of its operation. I raise this because of the validity of a point which David Thompson made, he expects that people will still reject the results. if our mediums are prepared to take this step forward then we have to ensure that the results are accepted by everyone and all the old tired arguments are finally put to rest. I think we can all agree that sometimes images may be inconclusive but if a clear picture appears it needs to be accepted across all the areas of critical review (although beating the rusted on anomalistic psychologists will be near impossible). However, if we prepare now, by testing the cameras as I have suggested, then a start to preventing problems has been made. Dare I then suggest something Lis came up with this morning, that the AFC sets a week aside where the current Physical mediums, who are performing public seances, are invited to Stansted to conduct a public seance each, under the new protocols. These could be paid for and the money used to pay the visiting mediums expenses. The idea also comes about because it may be expected that, at this time, they have the best technology available. It would be important that all concerned knew that this was not a final, conclusive, judgement on their mediumship. It is clear that there are many reasons why a seance, under these new pressures, may not deliver the conclusive results we may all want. Therefore, judgement should not be made about the validity of anyone's mediumship afterwards ( I suppose unless the actual results were absolutely crystal clear in either direction genuine or false and after discussion with that medium). The week may end up being entirely inconclusive but it would make a start to the use of cameras and provide valuable information about the way they are operated in practice rather than theory.